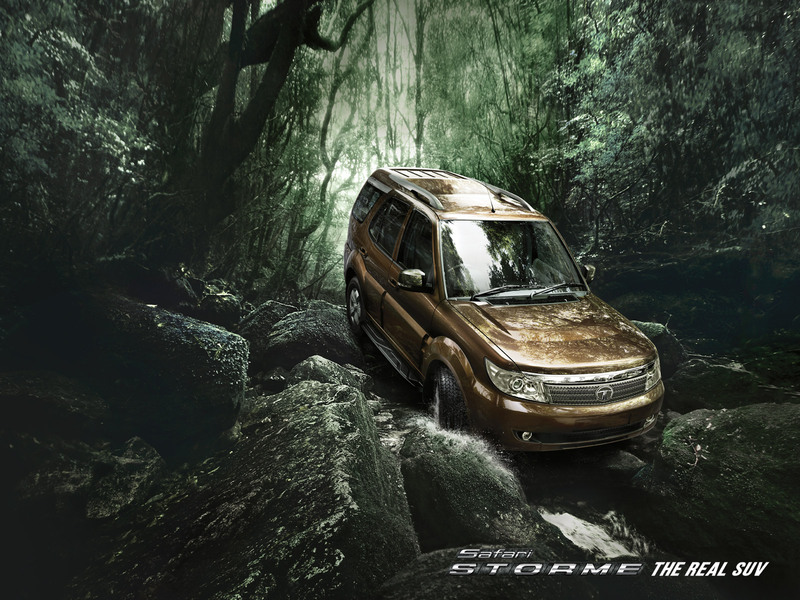 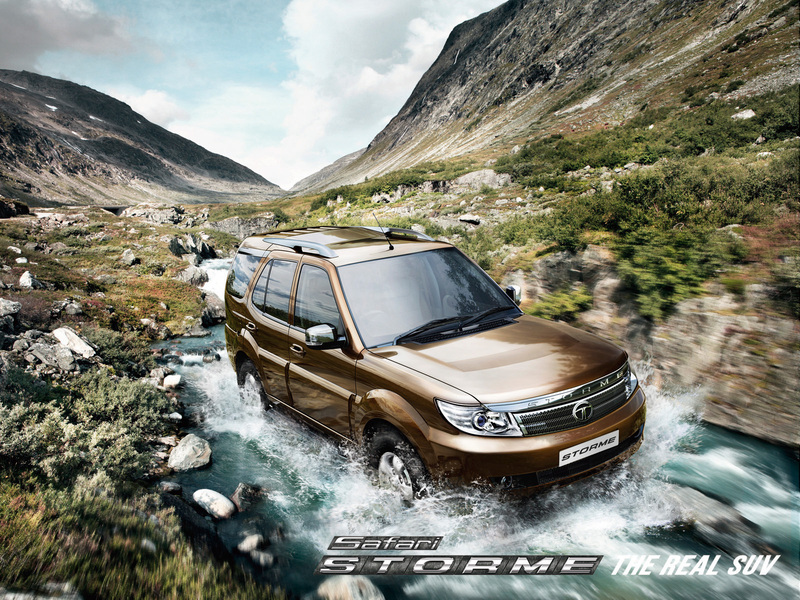 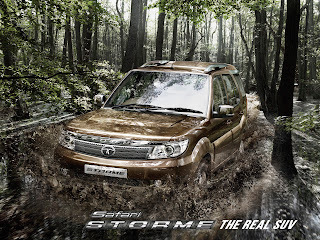 Tata Safari came to the indian auto market in 1998.At that time, there was no indian SUV.After 14 years, a new upgrade of this model is getting out ot the Indian market.They are calling it the Safari Storme.Hydrophobic chasis is used in Storme. 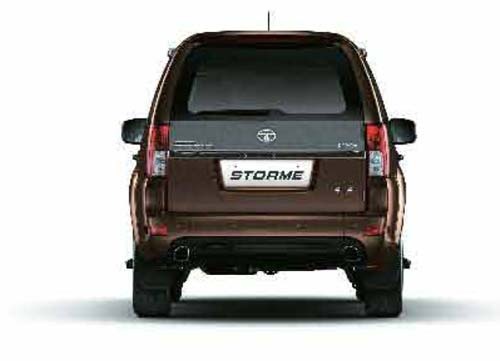 That made it lighter in weight by 75 kgs. 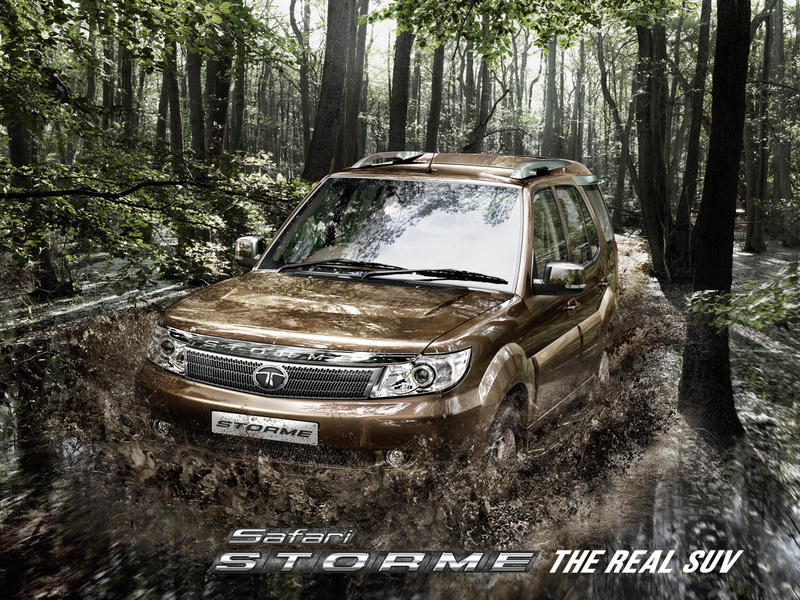 The basic look of Safari has been preserved in storm.A big grill between the two headlights is present in Storme.On top of the gril a big chromium finish is present and on which Storme is written.In bumper also small grills are added (see image).More clearer and edgy projector headlight lamps lighten up the roads of STorme.Big front and rear wheel archs and the connecting bodylines between them makes the vehicle look like a big one.Silver colour roof rails which was an attraction of old Safari is present in Storme also.Rear design is disappointing.Uninspiring design compared to the other designs.Spare tyre fitted on the rear has been moved to the position under the vehicle.Vertically arranged clearlens tail lamp is the only Suv-ness of Safari Storme rear design. 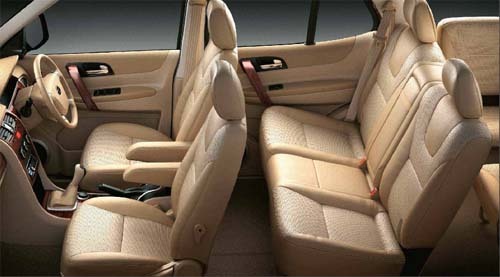 Tata Aria like dashboard and steering is present in Storme.Biege coloured interiors with good plastic quality.One noticable feature in volume control in indicator switch.The quality of seats is good.Safari has been made more luxurious.A general disadvantages in all SUVs is that the second and third row seats offer lesser traveling comfort.Just travel in the rear seats of Tata Safari Storme and feel the difference. 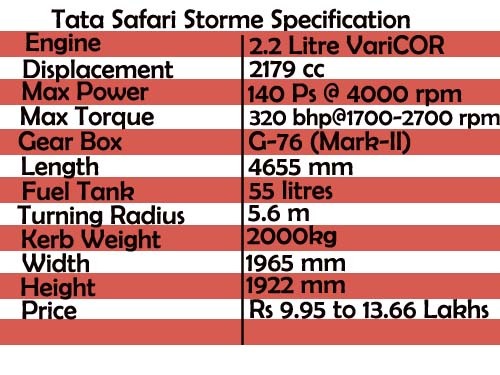 2.2 Litre engine in old safari and Tata Aria has been retained.Low end performance has been improved.Power is 140 Ps @ 4000 rpm.Torque is 320 Nm at 1700 to 2700 rpm.Gear box is very smooth.It feels that the engine offers more power than old safari. Good drivability and smooth driving was experienced.Non SUV users can also drive this big car with ease.Suspension is of first quality and delivers good on guttered indian roads.In four wheeled drive version, without switching off the vehicle , you can change from two wheel drive to all wheel drive.Little turbo lag is present in the vehicle but not that alarming.Lesser gear ration helps in city driving.You don't have to gear down often.Turning radius gets reduced to 5.6 metre in new Safari.